1827-1869 : During the Restoration period, in the aftermath of the French Revolution and while France was still reeling from political turmoil abd military upheavals, the champions of Romaticism, the dominant aesthetic movement then, were preparing a triumphant revival of decorative arts. Precious meals and stones were in short supply and most jewelry was still inspired in its designs from Middle Age and Rennaissance trends. 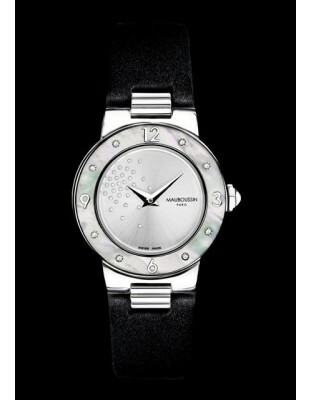 This is the precise time when Monsieur Rocher opened his jewelry shop, located in Paris 64 rue Greneta. Nothing much happened in term of jewelry design until the Second Empire, when Napoleon III and the Empress Eugénie help boost in a decisive way French jewelry craftsmanship. This is also the time when diamond mines were discovered in the Cape of Good Hope region. Money had started to flow again among the pioneers of the Industrial age and these people were showing a great interest for jewelry, wich never abated despite renewed political conflicts and uncertainty. History remembers the bloody moments of the Commune in Paris in 1871. It is around that time , in 1869, that Jean-Baptiste Noury, Rocher's associate, took the business over. 1873-1878 : World fairs in Vienna in 1873 and in Paris in 1978 featured a surge in jewelry creativity. Noury's firm was present at both events and was even awarded a bronze medal during the Parisian show. 1879-1923 : During those what has become known as 'the House of Noury' became a well-known French jeweler, gaining grounds vis-à-vis its direct competitors like Fouquet or Vever for instance. The House of Noury was particularly noticed for the quality of its stones. Jean-Baptiste Noury was instrumental in this success and remaided at the head of his firm until 1898. He even started an extremly successful export business with dealers in South America. 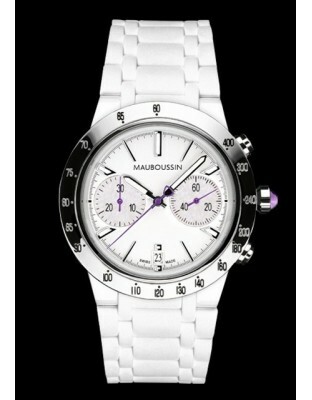 In 1922, the Jeweler changed its name for Mauboussin, Sucessor to Noury. The groundwork had been laid out and the new management was quick to capitalize on Noury's work both in France and in Argentina and Brazil. Worth mentioning at that time of the first part of the XXth century, was the dominant position Mauboussin developed in the pearl business. The name changed from Noury to Mauboussin happened because it was Noury's nephew, Georges Mauboussin, who gradually took over the business from his early days as an apprentice back in 1876 until 1898, when he purchased the firm. For a long time, the sign outside the shop read 'B. Noury, G. Mauboussin Successor'. Georges Mauboussin decided in 1923 to move the business to and address at 3 rue de Choiseul, closer to the other luxury shops located in the center of Paris, around Place de l'Opéra. 1925 : The great 'Exhibition of Decorative Arts' in Paris attributes a leading role among the great Paris jewelers to Mauboussin. 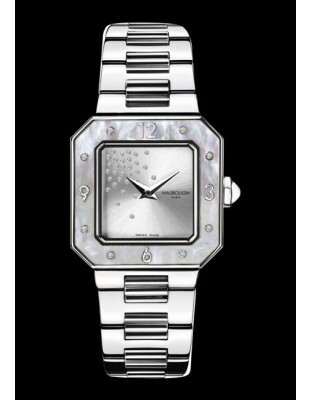 During the higly creative 1920s, Mauboussin produces numerous magnificent Art Deco designs. The trio of exhibits confirms Mauboussin's reputation for innovation and its particular expertise in the realm of colored stones. 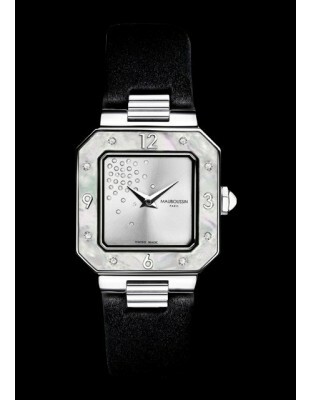 1940-1950 : Mauboussin's style takeson new assurance in this period. Gold is scare in the post-war years, and to mask their penury jewelers take two working in hollowed, or 'gas-pipe' style. The themes, and work that features a sense of movement and dynamism. 1955 : A wind of anti-conformist views and social protest sweeps across the West . In jewelry, as in other fields, the creative pursuit tends towards exess, disproportion, and asymmetry. 1980 : Creativity focuses on the contrast between light and shadow. Shapes are crafted to suggest sensations. The 80s clientele is narcissistic, and hypersensitive to the personal 'look'. Mauboussin creates jawels in rounded shapes, closed in on itself, which corresponds to the individualism of the era. Designs, one of the great designs of the period. 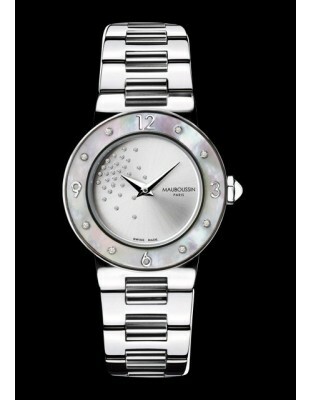 Mauboussin Watch making is created at this time. 1991 : Creation of the 'Olympe' ring. Its origins reach back to Classical architecture. The proportions are carefully designed to accompany the volume of the stone, and its type of cut (oval, pear, square or emerald), in accordance with the ancient canons of balance and beauty. The ring is part of Mauboussin's 'Eternelles' range, in homage to the precious stone. 2003 : The 'Peace Colours' ring is created. The collection espouses its era - the modish, baroque jewel is a real work of art, designed by the Artist-Jeweler to glorify colour and gaiety. The collection is unprecedented, featuring six different colours: aquamarine, tourmaline, green beryl, morganite, citrine and amethyst. The centra, 13-carat stones are hemmed majestically with saphires of unusual hues, in a magnificent play of iridescent colour. The satting adopts the emblematic design of the triangle, a symbol of he divin. 2004 : Mauboussin launches a new engagement ring, 'Dream & Love'. This resolutely creative design gives women the opportunity to adopt an engagement jewel in a more modern spirit, not simply to conform to tradition. 2005 : The famous jewelryline, Chance of Love marked a new evolution towards the Mauboussin dedication to the modeern and independent women. In 2007, this jewel was chosen to be the first ever advrertised on French television networks. In 2008, the latest evolution of this line will come to life with The Chancy ring. 2007 : 2007 was a milestone year in many ways, with the Grand opening of a store on the mythical Parisian avenue des Champs Elysées and presence as a corner in the Grands Magasins Printemps. Since then, many corners are opening in various Printemps stores around France. In the same 2007 year, there was a complete shift of mauboussin's international distribution policy with the butyback of all their Asian distributors. The stores in Japan are now owned and managed directly by a Mauboussin team. 2008 : 2008, apart from this new website's launch, will be enlightened by the opening in September of our first American store, located in New York on Madison avenue. Mauboussin has also expanted its reach on chosen accessoires, like a pen ad sun glasses, both enjoying an extremely subtile design.